Roto Shake Genie® is a combination platform/tilt, shaker, rocker, and specialized rotator mixes tubes 6 different ways: rotating, rocking/ shaking, rotating/rocking, rolling/rocking and rotating/ rolling, as well as a combination of all these mixing actions. An optional 3-D Orbital Shaker Attachment transforms the unit into an orbital shaker. Easy to remove, two-sided 8” x 13.5” (20.3cm x 34.3cm) stainless steel magnetic platform easily converts from rotating to rocking with a simple mechanical adjustment. 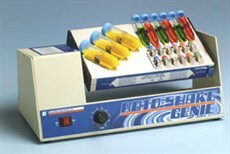 Read more about the Roto-Shake Genie on the Scientific Industries website. The importance oxygen levels play in various biological processes is increasingly significant to researchers. To study this requires consistent atmospheric control — maintaining hypoxia, normoxia, hyperoxia, or anoxia to mimic physiological conditions. Coy offers a complete line of glove boxes and cabinets that enable you to maintain desired levels of CO2, temperature and humidity, along with oxygen control. Visit the Coy Laboratory website the learn more about their O2 Control Glove Boxes and Cabinets. I recently acquired a Labophot 2 but the circuit board for the lamp has died. Nikon tells me I need the old style 'large' circuit board. My circuit board is marked HSV-6-30NC and has the electrolytic cans vertically placed on the board not horizontally like the newer 2-piece board. Can someone help me with finding a replacement board? Advise this member. Can someone please tell me the typical response time (rise time and decay time) of the green phosphor screen in JEOL 2100F TEM? Thank you for your help. Advise this member. When lifting the microscope stage with the coarse focus knob, at a certain point it drops down undamped all the way, slamming the condenser into the light source. Does this mean that the focussing mechanism is broken, or is there any way to adjust it to prevent this? Advise this member. Wetzlar, Germany. Leica Microsystems is launching the Leica DMi8 inverted microscope with built-in modularity that can grow and adapt to ever-changing research needs. With this new concept, life scientists can custom-configure an inverted microscope now and upgrade it in the future for applications ranging from basic imaging to advanced fluorescence microscopy. The Leica DMi8 is equipped with an additional incident illumination port, the Infinity Port, which facilitates the integration of additional light sources and laser systems for advanced applications. Read more. The Microscopy business group of ZEISS will present its first automated digital microscope. The device particularly stands out thanks to its one-of-a-kind operating concept, which makes operation as easy as possible for the user. In an industrial environment, optical inspection is an important part of production-related quality testing. Parts such as screws, printed circuit boards, and metal elements need to be examined for defects. Read more. FEI announced two new products for cryo-electron microscopy applications: a new phase plate solution and the Titan Halo™ transmission electron microscope (TEM). The phase plate is a stable, durable solution to increase the contrast of sensitive biological samples and is available on most TEM platforms from FEI. The Titan Halo TEM provides high-quality optical performance with enhanced flexibility for multi-scale applications in life and biomaterials sciences. Read more. Thank you to Phenom-World for sponsoring the Microscopy category on LabWrench. Phenom-World is a leading global supplier of desktop scanning electron microscopes and imaging solutions for sub-micron scale applications. Our SEM-based systems are used in a broad range of markets and applications. We continuously invest, develop and integrate our products to help our customers improve their return on investment, time to data and increase system functionality. With representatives in more than 40 countries and a fast-growing installed base, we are committed to support our customers with our highly specialized team of application and service specialists who provide application and service support on a global scale. Read more. Visit the Phenom-World website to see their full line of products. There are dark spots in field when I use filters, in bright field no problem. I checked all filters and lenses every thing is fine. Please help. Advise this member. What is the spot size for the electron beam at 10 kV and 250µA? Advise this member. I'm a user of JEOL 2200 FS with omega filter. I would appreciate if someone could tell me how to do EELS in TEM Mode ( at high magnification), should we correct stigmatism of Filter every time? Using alpha 3, spots 1 or 2 with ENTA aperture 4, to get better resolution, in SPECTROSCOPY mode the spot is always with a shadow ( long tail) unless I make the beam fully deconverged as I lose my signal even in ZLS. Does anyone have an idea on the reason of it? In alpha 1 it is even worse. Advise this member.